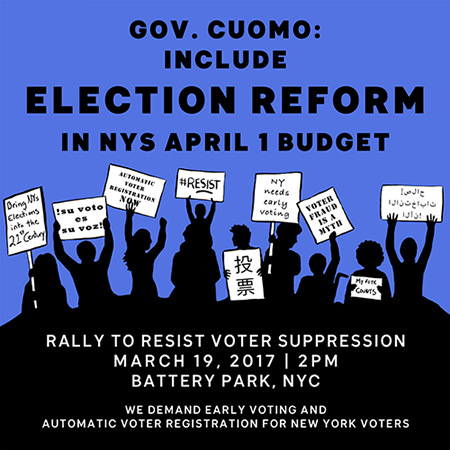 AALDEF joins the rally on Sunday, March 19 to tell Governor Cuomo: New York must be a leader in election reform, not an excuse for voter suppression. This year’s NY state budget must include essential voter reforms – early voting and automatic voter registration. But they must hear us NOW – while the budget is being negotiated! Join us in NYC on March 19! Join AALDEF, Common Cause/NY, SEIU 32BJ, NY Immigration Coalition, TWU 100, 2 hours A Week, Public Citizen, Citizen Action New York, New York Working Families, DuBois Bunche Center For Public Policy, Hugh L. Carey Institute, NYPIRG, and invited Members of Congress Hakeem Jeffries, Yvette Clark, Nydia Velazquez, and NY Assemblymember Latrice Walker, NYC Councilmember Ben Kallos, and others to demand election reform now. We reject the false assertion that voter fraud is widespread when the real problem with America’s elections is extensive voter suppression – not too many people voting, but too few voters voting. New Yorkers believe that voting is the lifeblood of democracy and demand that Governor Cuomo include essential voter reforms – early voting and automatic voter registration – in the state budget that will be adopted by April 1, 2017. It’s time for New York’s elections to join the 21st century and to end our state’s shameful record of low voter turnout. Thanks for standing up for voting rights!